Successful implementation of a new University brand requires consistency and clarity across communications. Whether you’re writing a newsletter, Facebook post, news release or magazine story, it’s important that all writing be consistent with the key messages, themes and style guide of the University. This section outlines how to do just that. Here, you will find more information about messaging and tone, editorial style and examples of how our brand story translates across channels. UNC Greensboro’s brand is communicated through individual stories that reflect the three brand pillars and positioning statement: welcoming environment, tenacious commitment to student success, and everyday real-world impact. 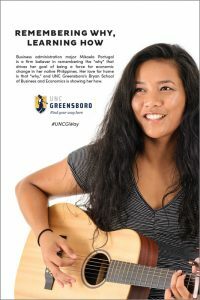 The tone of our University marketing and communications is bold, vibrant and reflective of a diverse array of students, faculty and staff who proudly call UNCG home. These messages come across in how we share our stories with aspirational and confident language to showcase our achievements and our impact on the greater community. Saying a lot with a little. In advertisements such as print ads and billboards, headlines should be brief, attention-getting and brand-pillar-focused. Brand imagery will not necessarily show the full action of what is occurring in the image. This is where the headline can draw the reader in and tease the message delivered in the body copy. Headlines are preferred to be third-person, but may be first-person when appropriate. These stories come to life in the body copy of our marketing and communications. Body copy should be kept to three to five brief sentences that support the associated imagery and headline. Body copy can be either first-person or third-person, with the preference being the latter. Naming: In our external communications, we will use UNC Greensboro primarily. 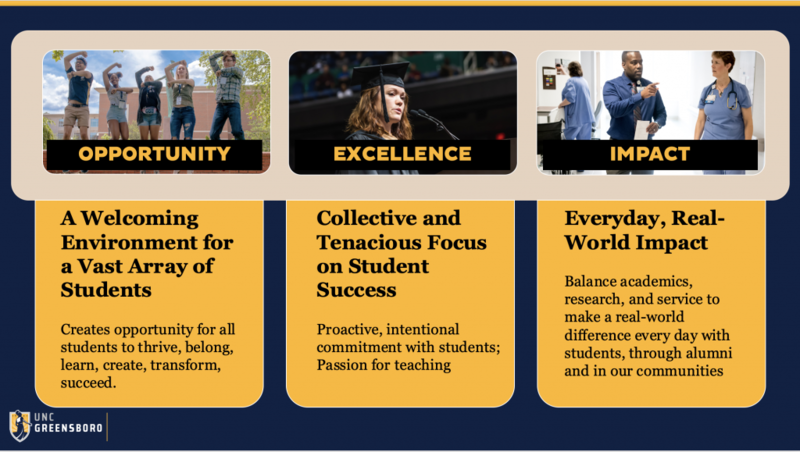 We will use UNCG in internal communications on campus, and where reasonable. Examples of external communications include news releases sent to local media, alumni newsletters, UNCG Research Magazine, etc. Examples of internal communications (on campus) include Campus Weekly stories, departmental flyers, campus-wide notices, etc. 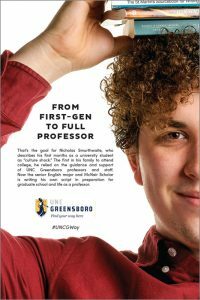 UNCG can be used on first reference on social media given character limitations. The full names of other universities are spelled out on first reference if they would not be immediately recognized by the audience. In most instances, the University follows AP Style. 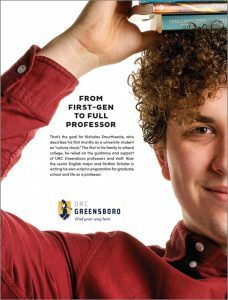 UNC Greensboro is used on first reference in communications directed to individuals off campus, such as admissions materials to prospective students, email updates for parents/family, messages to alumni, advertisements, news releases for local media, etc. 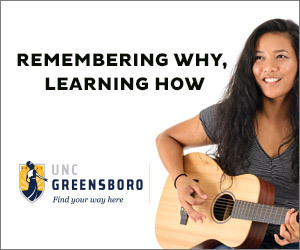 UNCG is used on second reference in most instances. It is used on first reference for communications solely directed to individuals on campus, such as Campus Weekly stories or campus emails, as well as on social media (given character limitations). When referring to UNCG, University should be uppercase. The University will be closed on Friday. Dr. Franklin D. Gilliam, Jr. is the chancellor of UNC Greensboro. Chancellor Franklin D. Gilliam, Jr. will give the keynote address. Chancellor Gilliam should be used on second reference. UNCG is a UNC System institution. System should always be capitalized. Express room numbers in the following way: Ferguson Building, Room 250. Kaplan Commons is the accepted name (on all references) for the lawn in front of the Elliott University Center. EUC lawn can be placed in parentheses after Kaplan Commons for clarification. MHRA Building is accepted on first reference for the Beverly C. and Irene M. Moore Humanities and Research Administration Building. 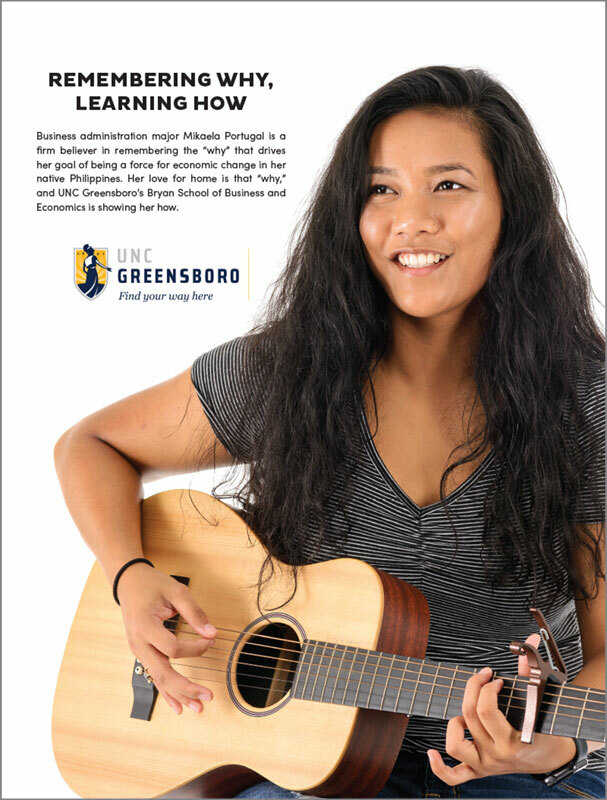 UNCG’s Millennial Campus consists of two districts: the Visual and Performing Arts Millennial District and the Health and Wellness Millennial District. Some rooms and auditoriums across campus are named for individuals. Room numbers should not be used when referring to these named spaces. Fountain View is the name of the dining facility on the second floor of Moran Commons. Moran Commons and Plaza refers to the building and the fountain area in front of the facility. Minerva statue is the name of the statue in between the Elliott University Center and College Avenue. Similar to the Charles Duncan McIver statue and Spartan statue on campus, “statue” is lowercase. The full name for the facility is the Leonard J. Kaplan Center for Wellness. An acceptable abbreviated name for the facility is the Kaplan Center. On first reference, the graduation year should follow the name of the alumnus. Degree abbreviations after the graduation year are added only for graduate degrees, not undergraduate degrees. These abbreviations do not have periods. 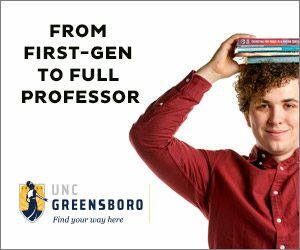 If the graduate holds more than one degree from UNCG, list all years of graduation and give the abbreviation of any advanced degrees. All graduation years should be listed after the graduate’s name and the years should be separated by commas. Position titles are only capitalized when they precede a name. With the exception of languages (English, Spanish, Russian, etc. ), academic disciplines are not capitalized. Degree titles are not capitalized. bachelor’s degree, master’s degree, doctoral degree, bachelor of science, bachelor of (fine) arts, master of (fine) arts, etc. On first reference, use the official name of academic departments. For example, Department of History. On second reference, “history department” is acceptable. Generally, UNC Greensboro follows the “Associated Press Stylebook”, which is used by journalists. 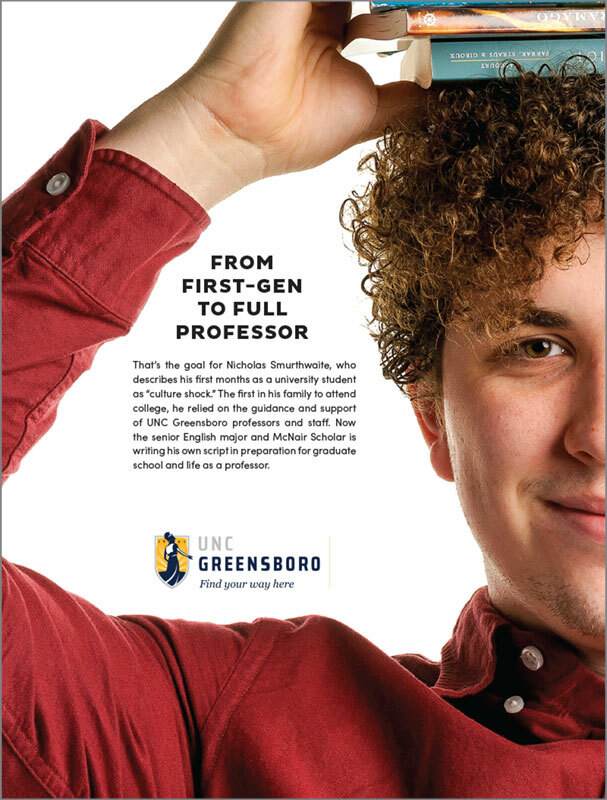 Academic papers might follow MLA or the Chicago Manual of Style, but UNCG has chosen AP for our publications because the style is familiar to a broad audience. While the guide includes AP style, we also have entries that are unique to UNCG, below. “B” in building is capitalized when used with the structure’s name. Use “the” to precede the Alumni House. Do not use “the” in front of Elliott University Center or EUC, Jackson Library and residence halls. Abbreviate West and Street when referring to 1100 W. Market St. Spell out West Market Street when referring to the street and not a specific address or building. Position titles if they precede a person’s name (e.g., Professor of Biology Amy Adamson, Dr. Amy Adamson, professor of biology; Vice Chancellor for Business Affairs Charles Maimone, Charles Maimone, vice chancellor for Business Affairs). University units: boards, centers, committees, departments, institutes, programs and schools when referring to a specific unit. Place spaces around en dashes and em dashes. Use en dashes in the place of a hyphen to combine open compounds (e.g., I think she’s of college–university age); between periods of time where otherwise you may use the word “to” (e.g., The program takes place November–January). Use em dashes in the place of a number of punctuation marks, including commas, parentheses, semi-colons and colons (e.g., She is interested in biology and environmental science — although many people in the program prefer chemistry — and plans to pursue a graduate degree next fall). The main use is to convey an abrupt change of topic or thought. Hyphenate two or more words when they come before a noun they modify and act as a single idea. This is called a compound adjective (e.g., “a student-led organization”). When a compound adjective follows a noun, a hyphen is usually not necessary. However, some established compound adjectives are always hyphenated (see below). Always use hyphens for the following: campus-wide, university-wide, pre-dentistry, pre-medicine, pre-veterinary medicine, pre-service, in-service pre-college and service-learning. Indicate decades without an apostrophe (1890s, 1970s). Use an apostrophe if numerals are left out (’90s, ’70s). Use bachelor’s degree and master’s degree (with apostrophes). Use doctoral degree or doctorate, not doctor’s degree. Spell out a month when it is used with and without a date (January 1979, the event is January 12). Do not use a comma between the month and year. Place a comma after the year if the sentence continues (The events of April 19, 1775, will be remembered). Use Oxford commas, also known as serial commas, before the conjunction in a series. She brought pie, milk, and cookies to the party. The icing was red, white, and blue. Spell out states in all cases (no longer use abbreviations). United States is used as a noun; U.S. is used as an adjective. Always lowercase and include periods for a.m./p.m. Use quotation marks (not italics) around the titles of books, book chapters, songs, television programs, computer games, poems, stories, essays, lectures, academic articles, speeches, works of art (paintings, drawings, sculptures), plays, presentations, musical compositions and movies. Do not use quotations or italics around the names of magazine, newspapers, journals, the Bible or books that are catalogues of reference materials. Faculty teach; however, they are not to be referred to as teachers. Use correct titles. Instructor is a title and should only be used for those who hold that rank. Faculty is a collective noun that uses a singular verb. For more information about titles, see Capitalization.